We have various roles at the support centre, they range from supporting the shop area, Cooking therapy, Liaison Officer (training given), Maintenance or peer support mentor. Admin, Finance, Client Support Systems, CIS support, or help with project management and development. 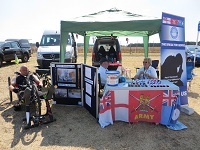 The Centre has a small exhibition covering most aspects of the armed forces, we need those interested in these subjects to help maintain and develop the area, also volunteers are needed to help with outreach in Schools, Retirement homes etc. Either at the Centre, or as part of the Guardian Troop team. Alternatively support some of the local events we get involved with such as the King’s Lynn Air Raid Shelters.